pictures without paint, and feelings with just a few words. 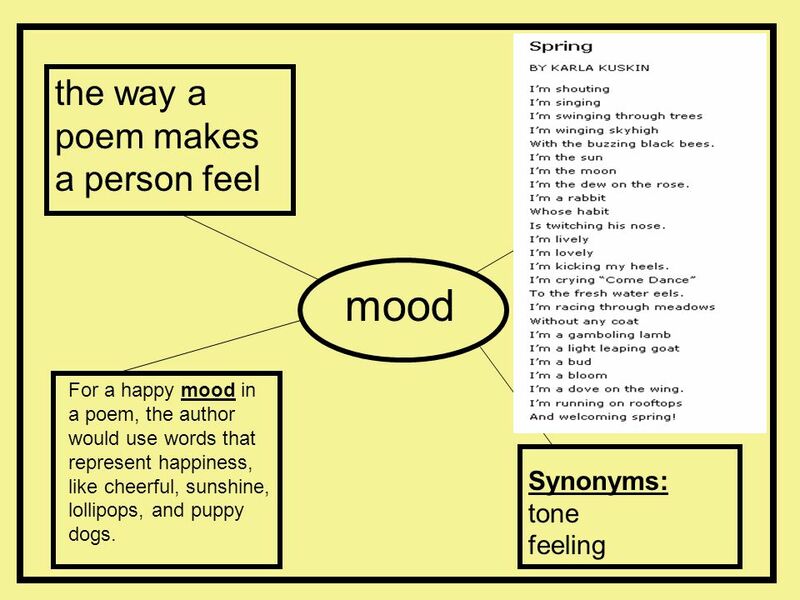 2 A poem describes things, shares a feeling, and tells a story. 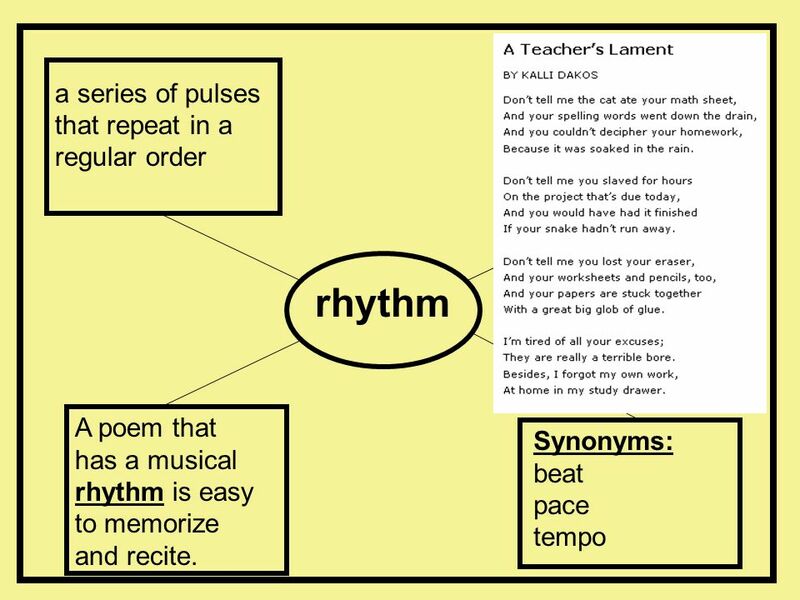 A poem has a rhythm, or pattern of beats, like a song. 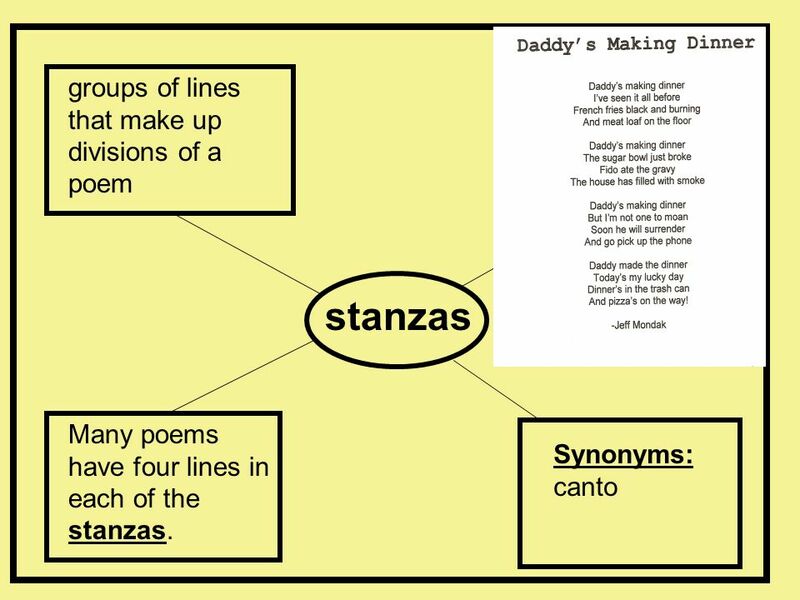 A poem may by made of parts, or stanzas. 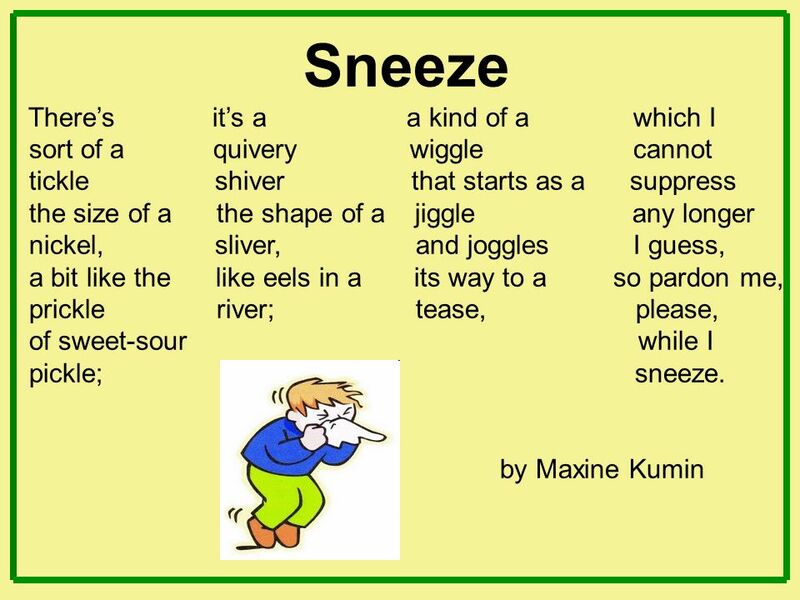 The words in a poem may make a shape. 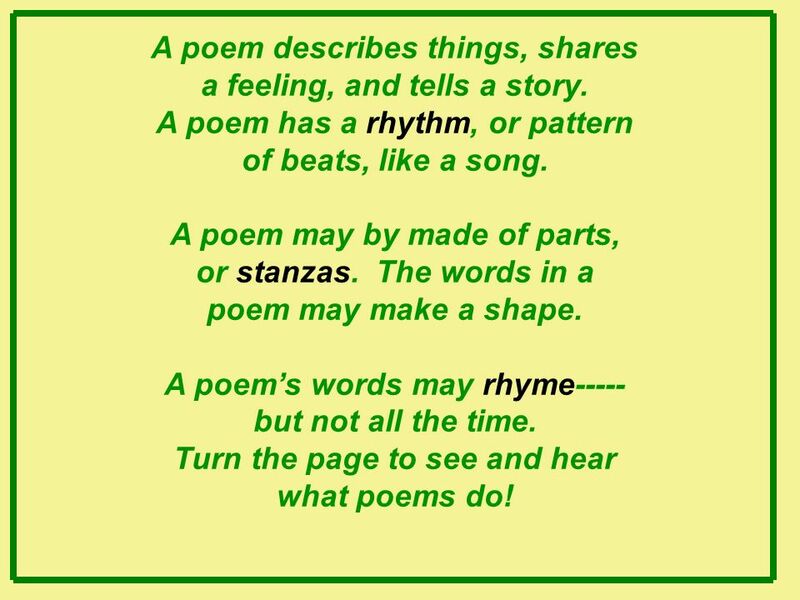 A poem’s words may rhyme----- but not all the time. 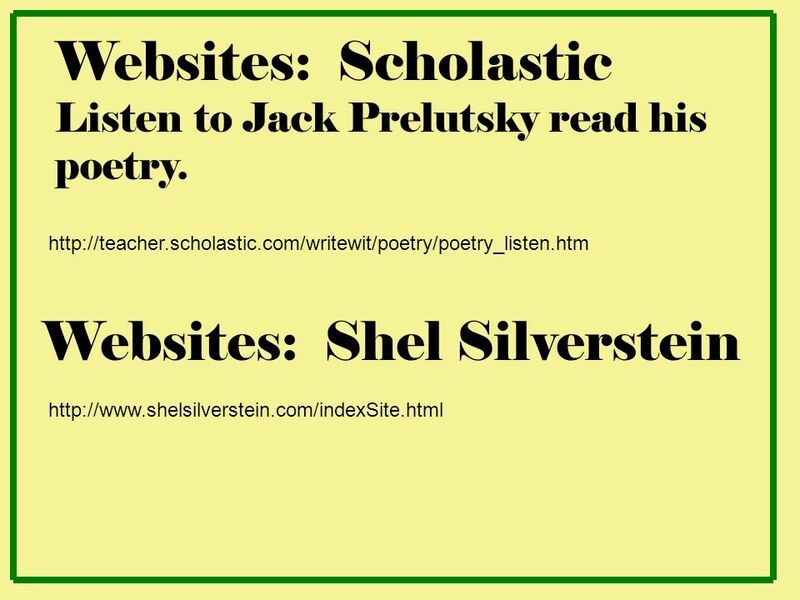 Turn the page to see and hear what poems do! 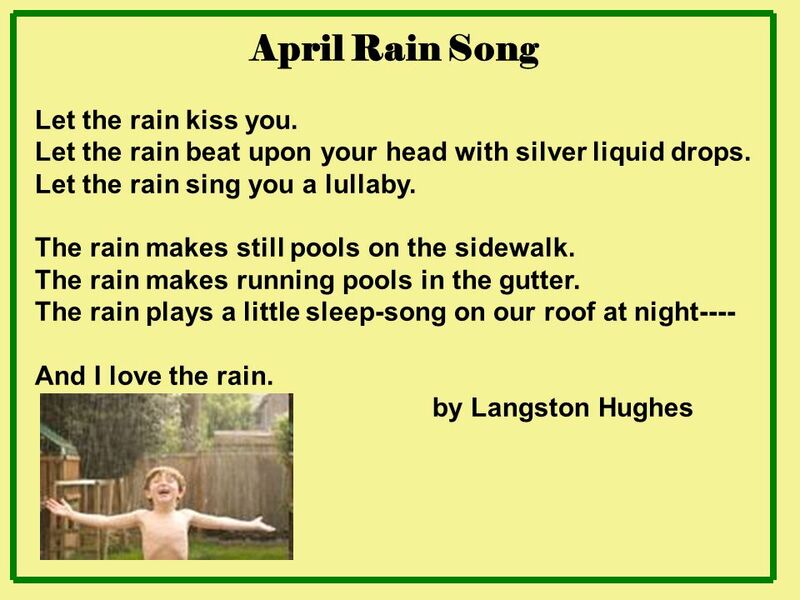 3 April Rain Song Let the rain kiss you. 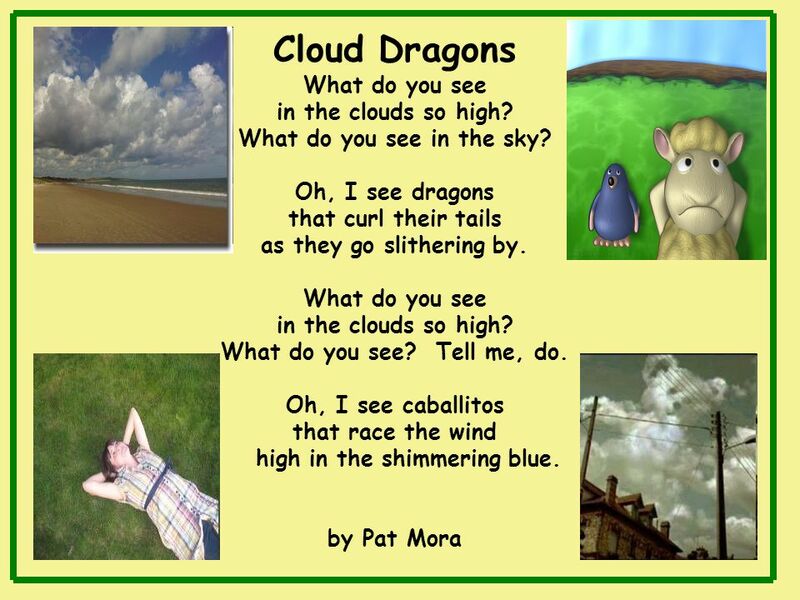 6 Cloud Dragons What do you see in the clouds so high? 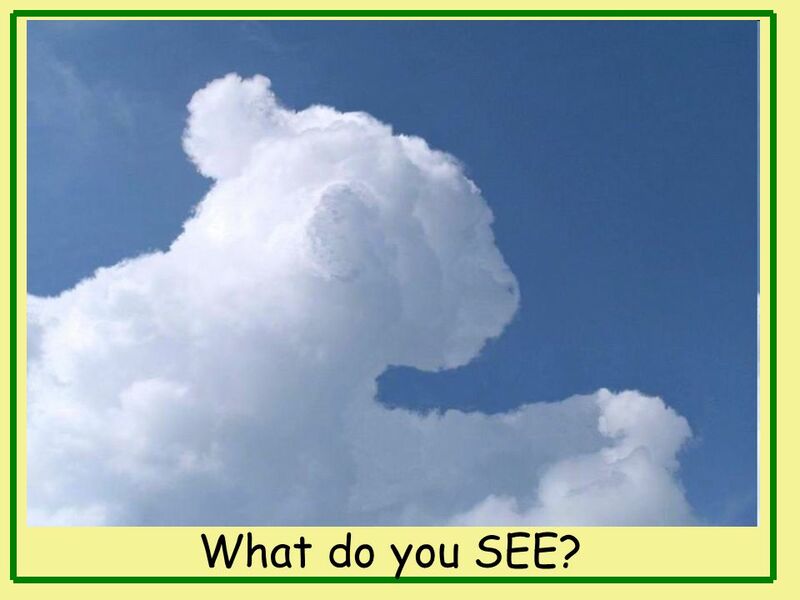 7 What do you SEE? 9 Spaghetti! Spaghetti! Spaghetti! spaghetti! Spaghetti! spaghetti! You’re wonderful stuff, I love you a lot, I love you spaghetti, you’re slishy, you’re sloshy I can’t get enough delicious and hot. 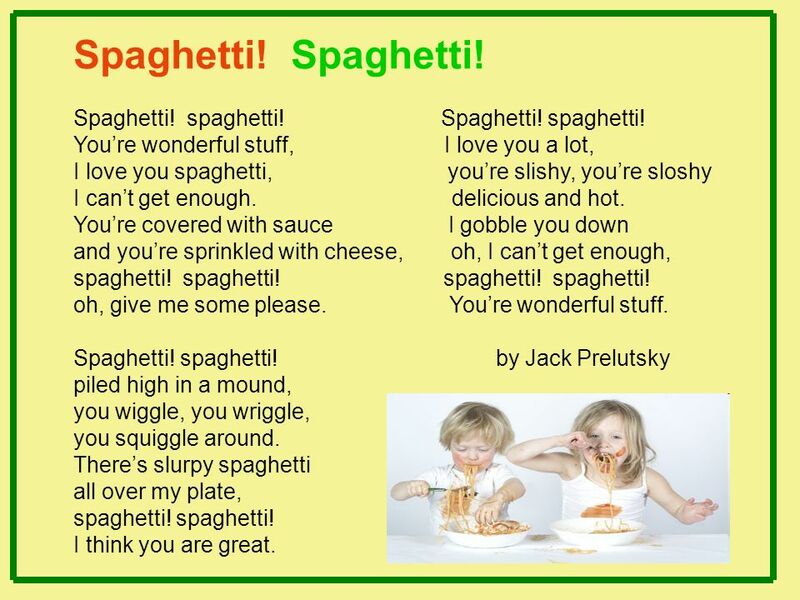 You’re covered with sauce I gobble you down and you’re sprinkled with cheese, oh, I can’t get enough, spaghetti! spaghetti! spaghetti! spaghetti! oh, give me some please You’re wonderful stuff. Spaghetti! spaghetti! 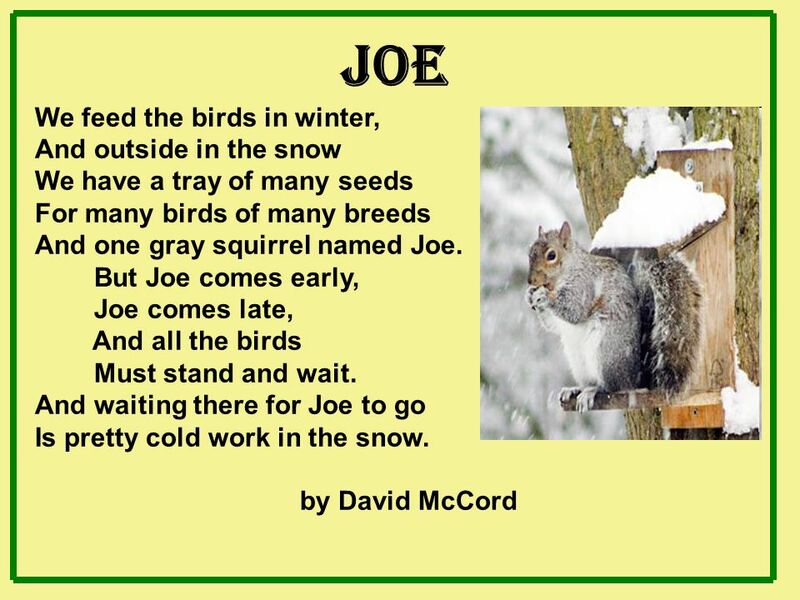 by Jack Prelutsky piled high in a mound, you wiggle, you wriggle, you squiggle around. There’s slurpy spaghetti all over my plate, spaghetti! spaghetti! I think you are great. 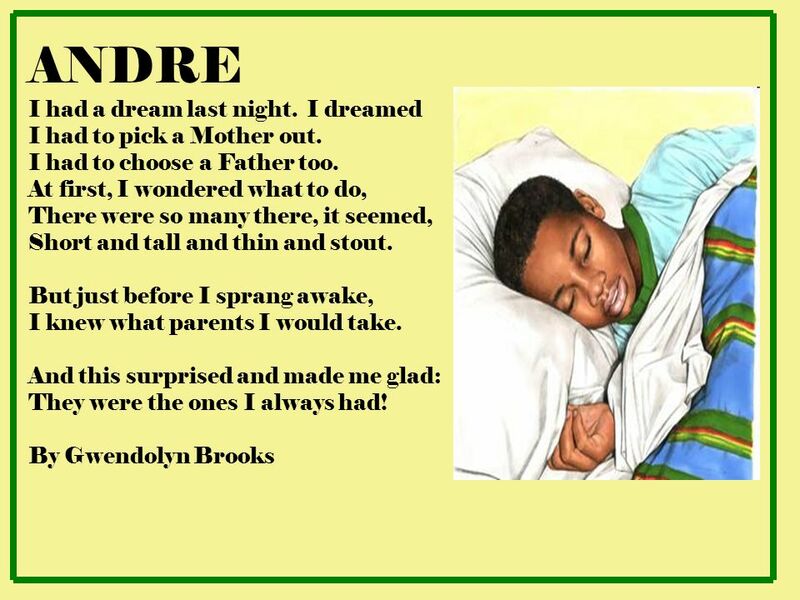 10 ANDRE I had a dream last night. I dreamed I had to pick a Mother out. 11 The Bat by Douglas Florian The bat is batty as can be. It sleeps all day in cave or tree, And when the sun sets in the sky, It rises from its rest to fly. All night this mobile mammal mugs A myriad of flying bugs. 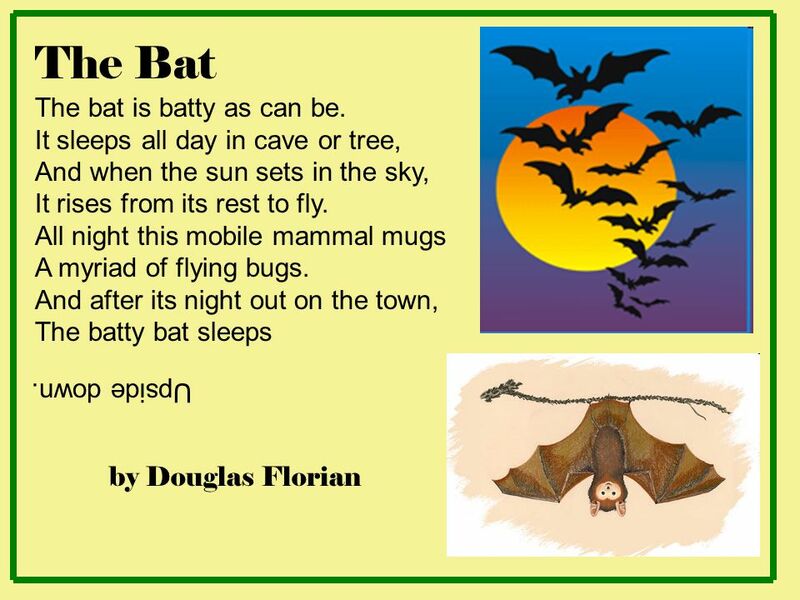 And after its night out on the town, The batty bat sleeps by Douglas Florian Upside down. 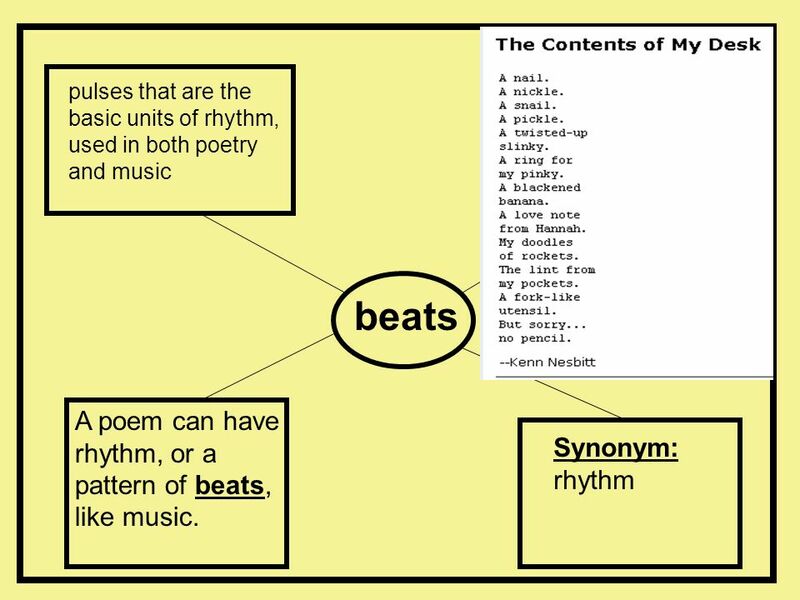 16 beats A poem can have rhythm, or a pattern of beats, like music. 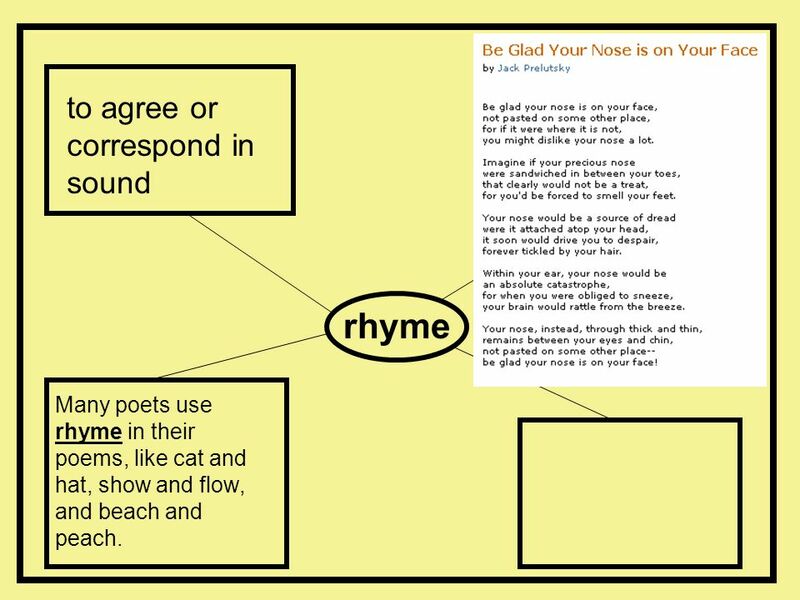 Many poets use rhyme in their poems, like cat and hat, show and flow, and beach and peach. 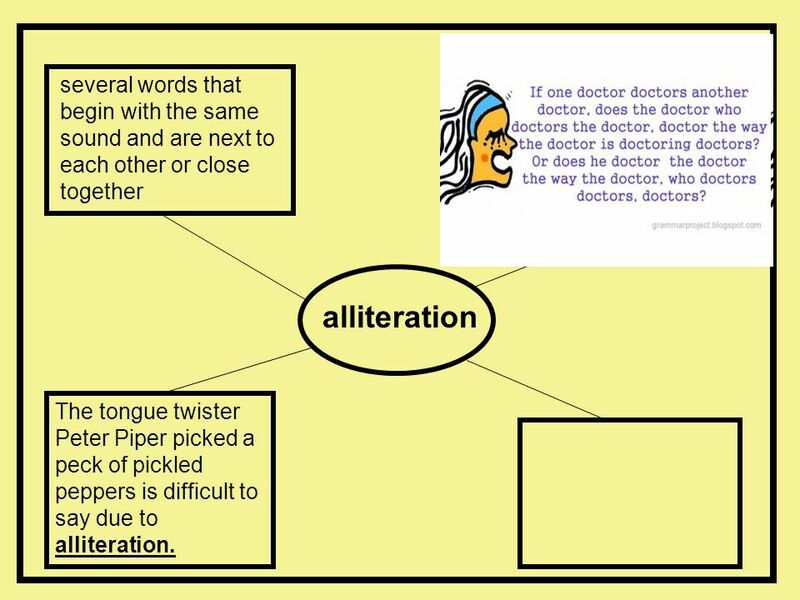 alliteration The tongue twister Peter Piper picked a peck of pickled peppers is difficult to say due to alliteration. 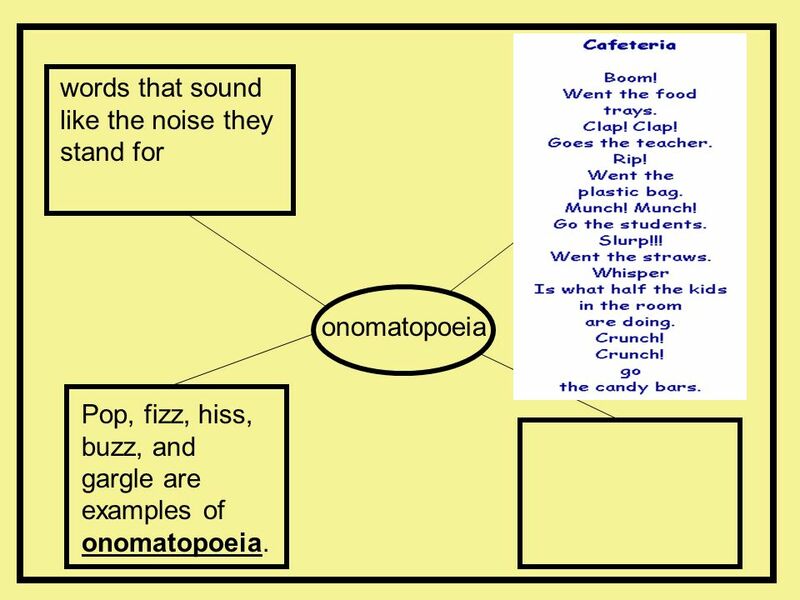 onomatopoeia Pop, fizz, hiss, buzz, and gargle are examples of onomatopoeia. 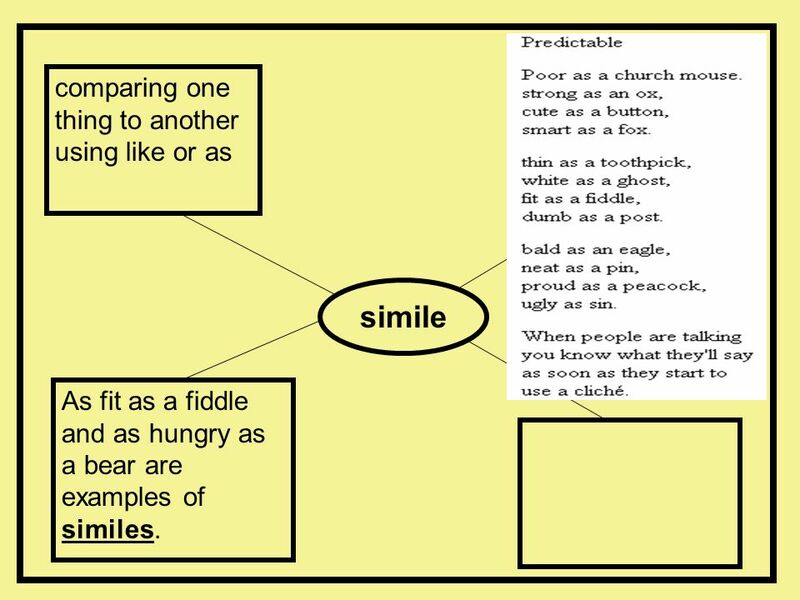 As fit as a fiddle and as hungry as a bear are examples of similes. 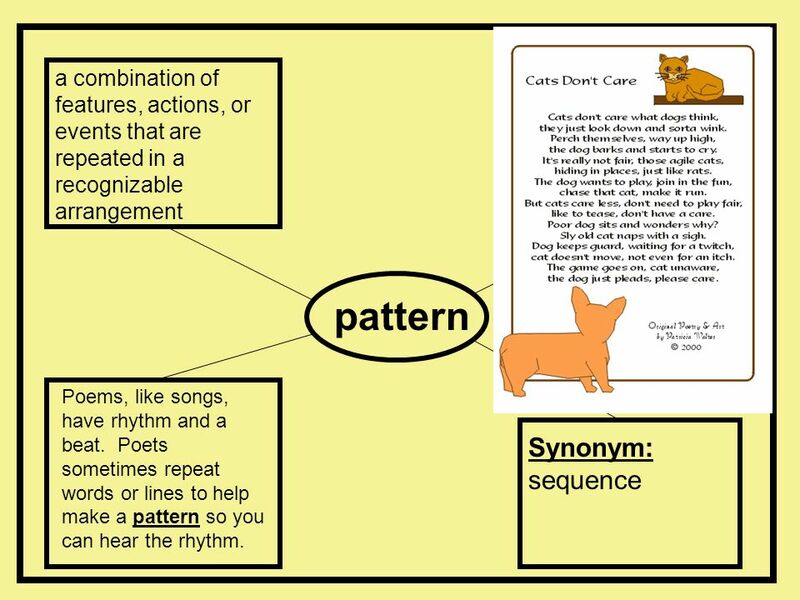 Download ppt "Focus on Genre Poetry Poems can create songs without music,"
Warm Up: Complete warm up located on your table. 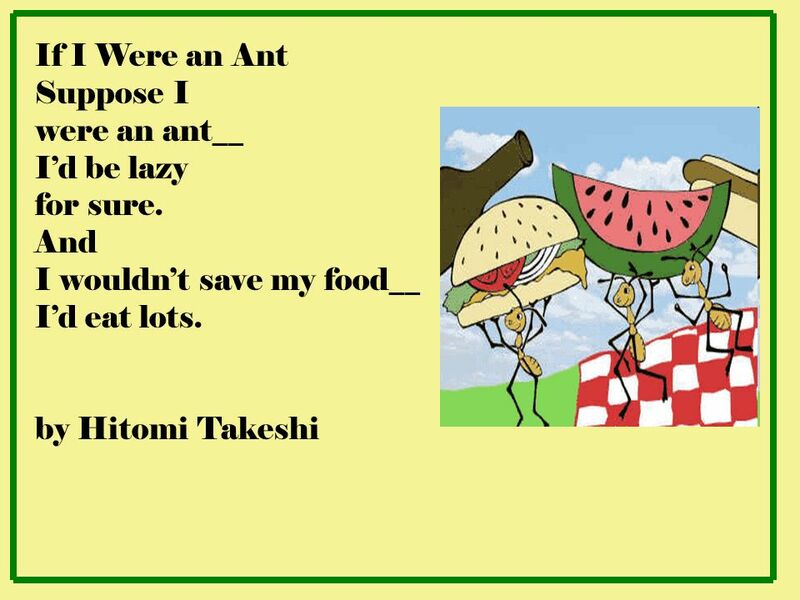 Use the correct verbs in context. ***Dont forget to write your name, date, and class period on your paper. 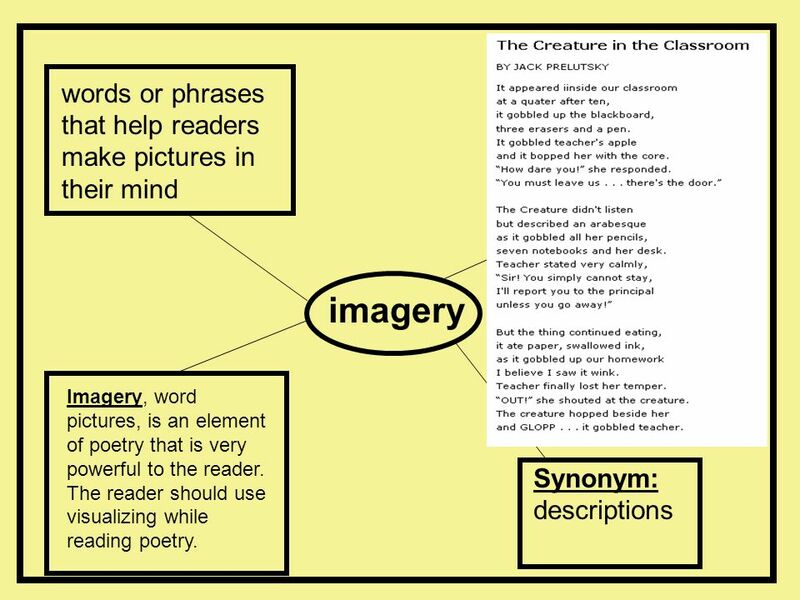 Poetry Terms Mrs. Withers English 9. 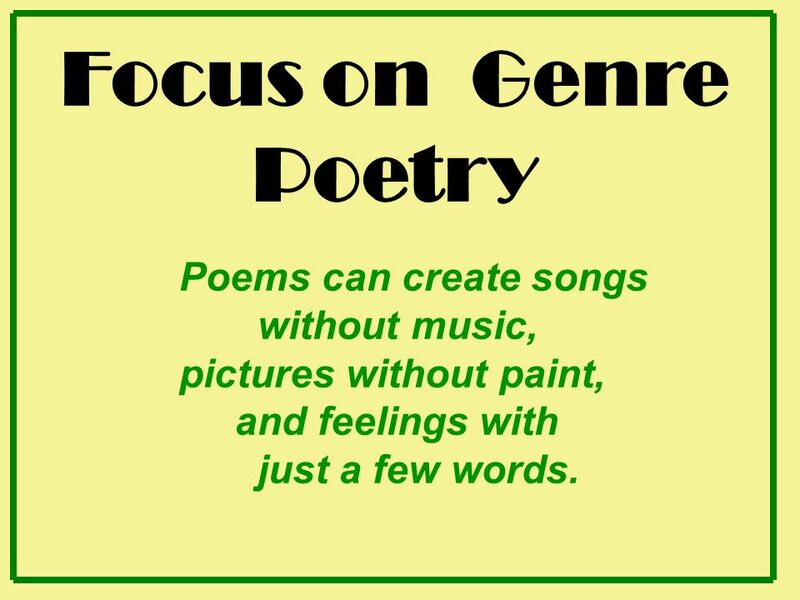 Genre Focus on Poetry By the end of today’s lessonBy the end of today’s lesson I will be able to write lines from poetry that rhyme to identify elements. 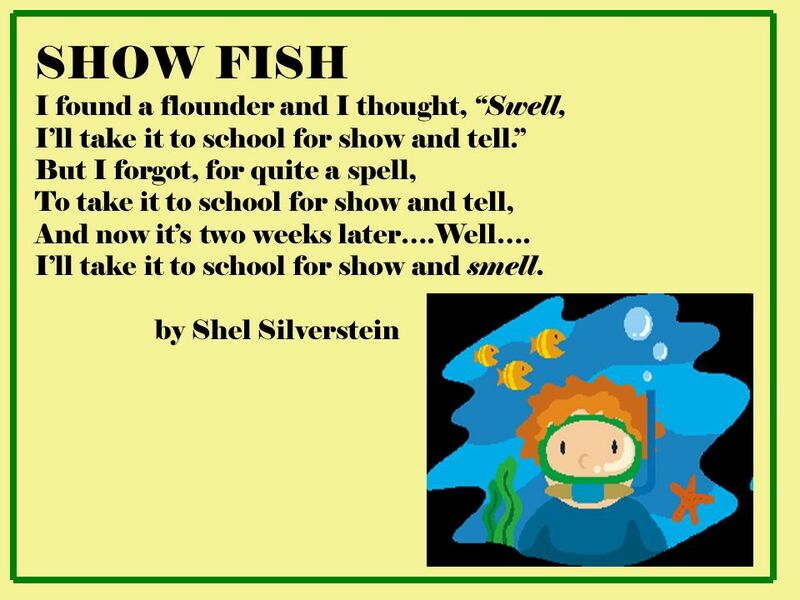 Poems Convey an idea or a feeling through carefully selected words and phrases. 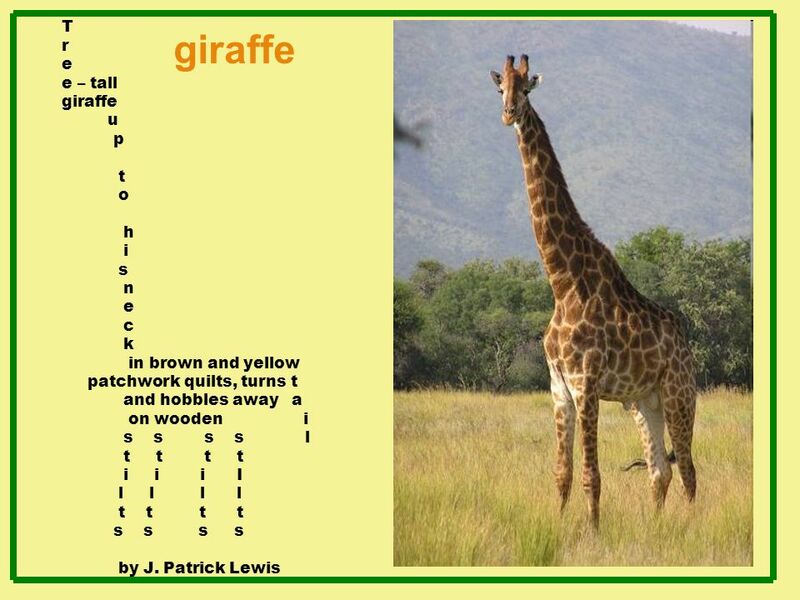 To unlock the meaning of a poem, you have to consider every word that the. Poetry Poetic Devices. Symbols SYMBOL - a symbol has two levels of meaning, a literal level and a figurative level. Characters, objects, events and settings. 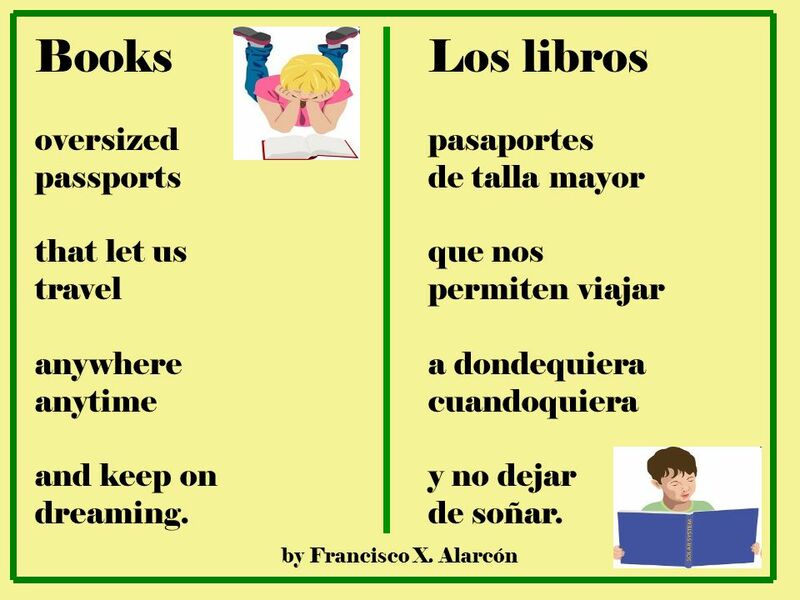 PoetryPoetry Grade 5. 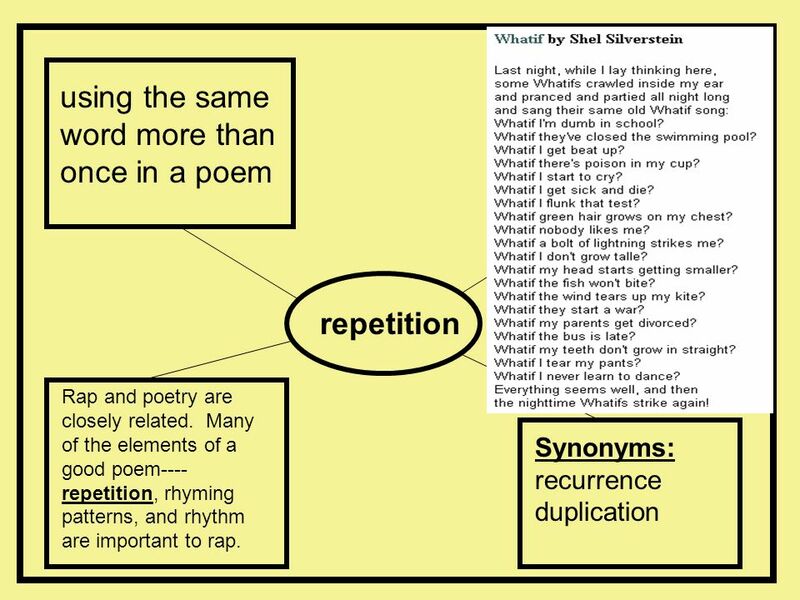 What is Poetry? Poetry is a kind of writing, usually in verse. 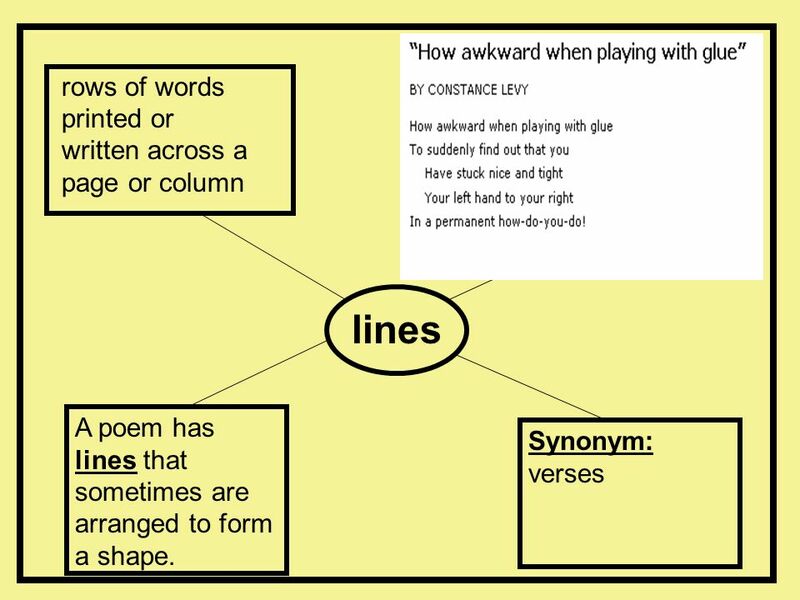 Poetry verse is set out in short lines with words put together in.